The taxonomic knowledge of living dinoflagellates (comprising about 2500 species) is scanty and restricted to few specialists worldwide. 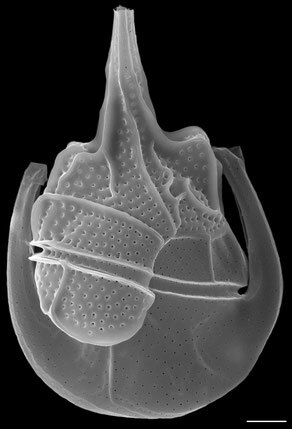 Nevertheless many new dinoflagellate taxa have been described over the last decades. The last worldwide revision of dinoflagellate species was published in 1937. Since then the taxonomic characterization of many species and genera has been changed or emended. Any taxonomic work starts with the original descriptions of the taxa that are often scattered in various European journals and rare books from the nineteenth century – not available to many scientists. The centre will provide a complete check-list of all described living dinoflagellate genera and species with exact bibliographic details. In addition we intend to provide all original descriptions electronically. Next to this core data it is planned to make available information of general interest for the dinoflagellate research community, e.g., references, bibliograpies, important links and images. In the future one main task will be to archive types and reference material from cultures or field samples of dinoflagellate blooms. The centre has been founded in July 2005 by Dr. Elbrächter, Prof. Dr. Martínez Arbizu, Dr. Türkay, and Prof. Dr. Steininger and is now in the process of development.